Flowing with the energy of dancing flames, two women weave illuminated patterns in a breathtaking performance of dance and fire artistry. 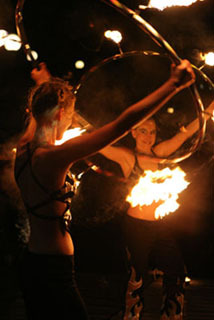 The graceful movement and the hypnotic effect of skillfully manipulating fire creates an original form of dance that keeps the audience mesmerized. Check out our Demo Videos or our Fire Picture Gallery. Find out more about Fire. As vibrant music delights your ears, intricate patterns and shapes are drawn in the air with swirling colored lights as dancers rhythmically move to entrance and enthrall audiences. The troubadours of Mini Cirque bring to life any place with creative costumes and make-up, lively performances and dynamic animations. 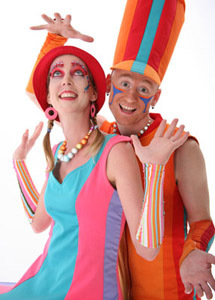 Through the circus, children as well as adults discover and reveal their talents. Mini Cirque also offers roaming stilt-walkers and jugglers. Find out more about Mini Cirque. All content and images on this site © 2003-2007 Fire Weavers.